Coriander (/ˌkɒriˈændər, ˈkɒriændər/; Coriandrum sativum), also known as Chinese parsley, the stems and leaves of which are usually called cilantro (/sɪˈlæntroʊ, -ˈlɑːn-/) in North America, is an annual herb in the family Apiaceae. All parts of the plant are edible, but the fresh leaves and the dried seeds (as a spice) are the parts most traditionally used in cooking. Most people perceive the taste of coriander leaves as a tart, lemon/lime taste, but a smaller group of about 4–14% of people tested think the leaves taste like bath soap, as linked to a gene which detects aldehyde chemicals present in both. First attested in English in the late 14th century, the word "coriander" derives from the Old French: coriandre, which comes from Latin: coriandrum, in turn from Ancient Greek: κορίαννον, koriannon, derived from Ancient Greek: κόρις, kóris (a bed bug), and was given on account of its foetid, bed bug-like smell. The earliest attested form of the word is the Mycenaean Greek ko-ri-ja-da-na written in Linear B syllabic script (reconstructed as koriadnon, similar to the name of Minos's daughter Ariadne) which later evolved to koriannon or koriandron, and koriander (German). Although native to Iran, coriander grows wild over a wide area of Western Asia and Southern Europe, prompting the comment: "It is hard to define exactly where this plant is wild and where it only recently established itself." Fifteen desiccated mericarps were found in the Pre-Pottery Neolithic B level of the Nahal Hemar Cave in Israel, which may be the oldest archaeological find of coriander. About half a litre of coriander mericarps was recovered from the tomb of Tutankhamen, and because this plant does not grow wild in Egypt, Zohary and Hopf interpret this find as proof that coriander was cultivated by the ancient Egyptians. Coriander seems to have been cultivated in Greece since at least the second millennium BC. One of the Linear B tablets recovered from Pylos refers to the species as being cultivated for the manufacture of perfumes; it apparently was used in two forms: as a spice for its seeds and as a herb for the flavour of its leaves. This appears to be confirmed by archaeological evidence from the same period; the large quantities of the species retrieved from an Early Bronze Age layer at Sitagroi in Macedonia could point to cultivation of the species at that time. All parts of the plant are edible, but the fresh leaves and the dried seeds are the parts most traditionally used in cooking, Coriander is used in cuisines throughout the world. Coriander potentially may be confused with culantro (Eryngium foetidum L.), an Apiaceae like coriander (Coriandrum sativum L.), but from a different genus. Culantro has a distinctly different spiny appearance, a more potent volatile leaf oil and a stronger aroma. The leaves have a different taste from the seeds, with citrus overtones. The fresh leaves are an ingredient in many South Asian foods (such as chutneys and salads); in Chinese, Thai, and Burmese dishes; in Mexican cooking, particularly in salsa and guacamole and as a garnish; and in salads in Russia and other CIS countries. In Portugal, chopped coriander is used in the bread soup Açorda, and in India, chopped coriander is a garnish on Indian dishes such as dal. As heat diminishes their flavour, coriander leaves are often used raw or added to the dish immediately before serving. In Indian and Central Asian recipes, coriander leaves are used in large amounts and cooked until the flavour diminishes. The leaves spoil quickly when removed from the plant, and lose their aroma when dried or frozen. The dry fruits are known as coriander seeds. The word "coriander" in food preparation may refer solely to these seeds (as a spice), rather than to the plant. The seeds have a lemony citrus flavour when crushed, due to terpenes linalool and pinene. It is described as warm, nutty, spicy, and orange-flavoured. The variety C. s. vulgare has a fruit diameter of 3–5 mm (0.12–0.20 in), while var. C. s. microcarpum fruits have a diameter of 1.5–3 mm (0.06–0.12 in). Large-fruited types are grown mainly by tropical and subtropical countries, e.g. Morocco, India, and Australia, and contain a low volatile oil content (0.1-0.4%). They are used extensively for grinding and blending purposes in the spice trade. Types with smaller fruit are produced in temperate regions and usually have a volatile oil content around 0.4-1.8%, so are highly valued as a raw material for the preparation of essential oil. Coriander is commonly found both as whole dried seeds and in ground form. Roasting or heating the seeds in a dry pan heightens the flavour, aroma, and pungency. Ground coriander seed loses flavour quickly in storage and is best ground fresh. Coriander seed is a spice in garam masala and Indian curries which often employ the ground fruits in generous amounts together with cumin, acting as a thickener in a mixture called dhana jeera. Roasted coriander seeds, called dhana dal, are eaten as a snack. They are the main ingredient of the two south Indian dishes sambhar and rasam. Outside of Asia, coriander seed is used widely in the process for pickling vegetables. In Germany and South Africa (see boerewors), the seeds are used while making sausages. In Russia and Central Europe, coriander seed is an occasional ingredient in rye bread (e.g. Borodinsky bread), as an alternative to caraway. The Zuni people of North America have adapted it into their cuisine, mixing the powdered seeds ground with chili and using it as a condiment with meat, and eating leaves as a salad. Coriander seeds are used in brewing certain styles of beer, particularly some Belgian wheat beers. The coriander seeds are used with orange peel to add a citrus character. Coriander seed is one of the main traditional ingredients in the South African Boerewors, a spiced mixed-meat sausage. One preliminary study showed coriander essential oil to inhibit Gram-positive and Gram-negative bacteria, including Staphylococcus aureus, Enterococcus faecalis, Pseudomonas aeruginosa, and Escherichia coli. 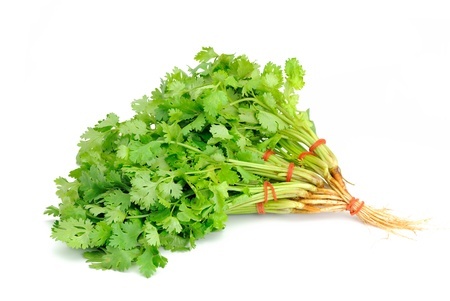 Coriander is listed as one of the original ingredients in the secret formula for Coca-Cola. Coriander roots have a deeper, more intense flavor than the leaves, and are used in a variety of Asian cuisines, especially in Thai dishes such as soups or curry pastes. In the Salinas Valley of California, aphids have been one of the worst pests in the lettuce fields. The USDA Cooperative Extension Service has been investigating organic methods for aphid control, and experimented with coriander plants and Alyssum plants; when intercropped with the lettuce and allowed to flower, they attract beneficial insects such as hoverflies, the larvae of which eat up to 150 aphids per day before they mature into flying adults. Raw coriander leaves are 92% water, 4% carbohydrates, 2% protein, and less than 1% fat (table). The nutritional profile of coriander seeds is different from the fresh stems or leaves. In a 100 gram reference amount, leaves are particularly rich in vitamin A, vitamin C and vitamin K, with moderate content of dietary minerals (table). Although seeds generally have lower content of vitamins, they do provide significant amounts of dietary fiber, calcium, selenium, iron, magnesium and manganese. The essential oil from coriander leaves and seeds contains mixed polyphenols and terpenes, including linalool as the major constituent accounting for the aroma and flavor of coriander. Different people may perceive the taste of coriander leaves differently. Those who enjoy it say it has a refreshing, lemony or lime-like flavor, while those who dislike it have a strong aversion to its taste and smell, characterizing it as soapy or rotten. Studies also show variations in preference among different ethnic groups: 21% of East Asians, 17% of Caucasians, and 14% of people of African descent expressed a dislike for coriander, but among the groups where coriander is popular in their cuisine, only 7% of South Asians, 4% of Hispanics, and 3% of Middle Eastern subjects expressed a dislike. Studies have shown that 80% of identical twins shared the same preference for the herb, but fraternal twins agreed only about half the time, strongly suggesting a genetic component to the preference. In a genetic survey of nearly 30,000 people, two genetic variants linked to perception of coriander have been found, the most common of which is a gene involved in sensing smells. The gene, OR6A2, lies within a cluster of olfactory-receptor genes, and encodes a receptor that is highly sensitive to aldehyde chemicals. Flavor chemists have found that the coriander aroma is created by a half-dozen or so substances, and most of these are aldehydes. Those who dislike the taste are sensitive to the offending unsaturated aldehydes and at the same time may be unable to detect the aromatic chemicals that others find pleasant. Association between its taste and several other genes, including a bitter-taste receptor, have also been found. Some people are allergic to coriander leaves or seeds, having symptoms similar to those of other food allergies. In one study, 32% of pin-prick tests in children and 23% in adults were positive for coriander and other members of the Apiaceae family, including caraway, fennel, and celery. The allergic symptoms may be minor or life-threatening. Other herbs are used where they grow in much the same way as coriander leaves.